I had a bad date this weekend. Not a date with an actual guy. (I'm not really in a dating frame of mind at the moment.) But a friend sent me a Facebook message likening my experience to a bad date, and having been on many (many, many) bad dates in my time*, she's exactly right. There's that same sense of disappointment that comes with having your hopes dashed, after the tingling anticipation of wondering whether this time, it will finally be a match. That same annoyed feeling of wasted time, followed by the same attempts to rationalize that in the end, it's really a numbers game, each disappointment bringing me closer to success. That same internal pep talk needed to pick myself up and, after a good metaphorical dusting off, start the process all over again. That same conviction that someday, hopefully soon, the right one will come along and things will finally work out. That we'll live, if not happily ever after, pleasantly and without drama for some unspecified extended period of time. Instead of looking for a romantic partner, though (see above, so very not), I'm looking to buy my first motorcycle. A used bike, preferably sportbike, preferably a 250 but in any case definitely no bigger than a 500. For these reasons, I'm mostly looking for a Kawasaki Ninja 250, although I'd also consider a Suzuki GS500 if one came along. There are a lot more so-called Ninjettes available on Craigslist, though, so that's the path of least resistance. This is a starter bike, pretty much ideal for someone like me who's a brand-new beginner. I mean, unless you count the 50cc Yamaha scooter my dad bought for us to use down in the Ozarks when I was 10 (which I don't), I've only ever been a passenger on any two-wheeled vehicle larger than a bicycle. 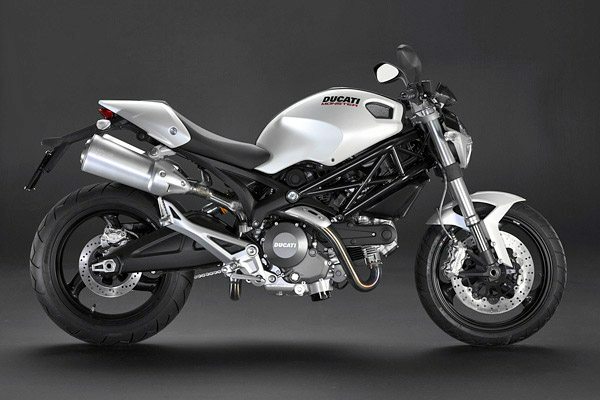 But I've loved them forever, and when I was living in Bologna I became obsessed with the Ducati Monster. That's still my ultimate goal, but even though I have my sights on the lowest rung of the Monster ladder (currently the 696, but who knows what will be around once I get to that point), I need to work up to it slowly. Over Thanksgiving weekend, I took the Basic Rider Course developed by the Motorcycle Safety Foundation, offered by a local school. It was... challenging, to say the least, also because of the aforementioned utter lack of experience. Although the course is designed for novices, I happened to be the only person in my group starting from zero: everyone else had, at the very least, been practicing on their boyfriend's/husband's/friend's/employer's bike, and several people had been riding for years. They were taking the course mainly just to learn better, safer riding skills; the rest of us were in it to obtain the motorcycle endorsement on our driver's license. Despite my inexperience, a very frustrating first day in which I kept stalling my bike, and even managing to lay it down during an exercise on the second day**,***, I managed to pass the test (and didn't even get the worst score in the class!). So I am licensed, but with nothing to ride. It's the two-wheeled vehicle equivalent of all dressed up with no place to go. And I am dressed up: I have all my gear except the helmet, which is my next scheduled purchase, and motorcycle-specific boots (I figure my Doc Martens will do for now). I have this jacket and these gloves, so I'm going for both protection and visibility. And, okay, aesthetics: I'm still me, after all, she who likes pretty things. So, you see, the bad date analogy holds up pretty well: lots of time, energy, and wardrobe expense invested, all of which raise the hopes. And yesterday my hopes were pretty high. This was a 2007 model with under 1,000 miles on it, so in practically new condition. It was at the very top of my price range, but well priced for how it was described. The seller said he'd bought it for an ex-girlfriend who was no longer in the picture, and he needed to make room in his garage. There was a little baggage there, clearly, but I was willing to overlook it in the name of a mutually satisfying arrangement. Alas, 'twas not to be. Although it only had one scrape on the left fairing, my friend who came along wasn't happy with the throttle response. The seller said a visiting buddy, who reportedly runs a shop on the East Coast, had recently cleaned out the carbs; my own expert suspected that they hadn't been reassembled quite right, or that the plungers had been damaged by the cleaning. Whatever the reason, he didn't want me to buy a bike that needed an immediate visit to a dealer to fix, especially since I was at the upper limit of my budget. Like any good, protective friend with my best interests at heart, he assured me that I could do better if I kept looking. And I will. I know the Ninja isn't my long-haul love, but I look forward to finding one to enjoy while I can, learn some important lessons, and move on when the time comes. Hopefully without too much damage to either of us in the process. *No, seriously. My bad dating stories are the stuff of legend in some circles. **Guess what? when stopping in a curve, they're not kidding when they tell you that failing to straighten it out before braking will send it right down--especially if you squeeze the front brake too hard, and then accidentally roll the throttle in panic. Yeah. I'm dumb, and an uncoordinated beginner. You see why I need to start with something small that is less likely to kill me when I make a stupid mistake. **I have to admit, the scrape and gigantic bruise on my lower calf, caused by the still-spinning rear tire that I went not-quite-entirely around as I hopped off the falling bike, made me feel kind of badass. But I'm not looking to repeat the experience any time soon if I can help it. BREAKING NEWS: Just as I was finishing this post, my friend called to alert me to another bike on Craigslist, which he called about; we're going to go check it out tomorrow night. My hopes are up again... wish me luck.